Shannon Miller, Patricia Davis (St. Vincent De Paul) and Karen Willis. THEY say an act of kindness goes a long way and the burgeoning relationship between Currajong Disability Services and St. Vincent De Paul Parkes continues to go from strength to strength. St. Vincent De Paul or Vinnies as many know them by, continue to support Currajong through a number of kind contributions with the latest being material donations to the Currajong Disability Services Sewing Group. 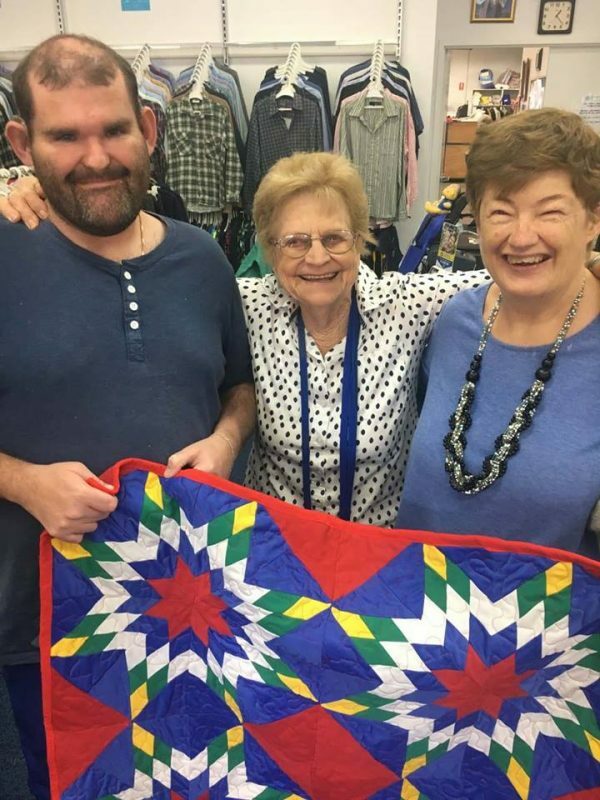 The Currajong Disability Services Sewing Group has since turned the material into unique one-of-a-kind quilts and donated them back to Vinnies – proving that kindness does in fact come around. For Currajong Disability Services Sewing Group founder and Currajong Disability Services support worker Deitre Jackson, the relationship between the two organisations continues to grow and knows no bounds. “Vinnies have been great supporters of Currajong and when we had the opportunity to do something for them it made sense,” said Deitre. “Our group were very excited to be able to make these quilts for Vinnies. In a market where every organisation is seeking funding, the tandem support Currajong and Vinnies have offered each other proves that there is room for growth, innovation and kindness in rural country areas. Deitre agrees. “These small acts of kindness and generosity, accumulatively, have a major impact on organisations like Currajong,” said Deitre. “We look forward to continuing our relationship.